Chelsea won the FA Cup after defeating Manchester United in the final, but their season has not been a successful one. They will play in the Europa League during the next campaign after finishing fifth. This has led to assumptions the Blues will part ways with Antonio Conte and bring in a new manager. Maurizio Sarri was identified as a candidate to replace his compatriot at Chelsea. However, his contract at Napoli is still valid as per the Italian law, even if the Serie A outfit appointed Carlo Ancelotti as their new boss. Napoli president Aurelio de Laurentiis is asking for a fee of €8m to part ways with Sarri. Chelsea, Conte and Sarri are now in a limbo because of the latter’s situation with the Serie A club, and Catalan newspaper Sport claims the west London club could turn their attention towards Luis Enrique. The Spaniard took a one year sabbatical after being released by Barcelona last sumer. Chelsea opened negotiations with Enrique a few weeks ago, according to the claims, but the deal did not progress further. Sport reports the two parties have now come back to the discussion table and the talks are progressing. 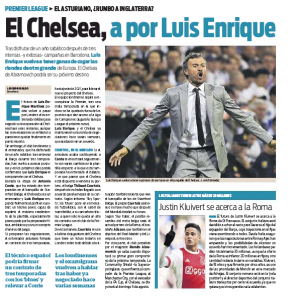 Enrique could be confirmed as Chelsea manager in the “next few days”. He will reportedly sign a three-year deal with the Premier League club, which will see him lead the new project at Stamford Bridge until 2021. Prior to his confirmation, the Blues will have to close Conte’s chapter by showing him the exit door. Chelsea want to bounce back after a disappointing season by winning the Premier League in the 2018/19 campaign.